As part of internet week, to celebrate 'the joy of Geek Cakes', and to raise money for research into pancreatic cancer, blogger Miss Cakehead is setting up a cake shop for one day only at The Hospital Club. The main tag for the coverage is cakes inspired by Steve Jobs, but there will be others to enjoy too. 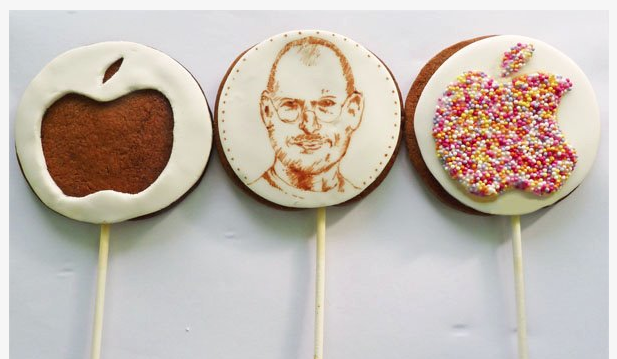 "All of the cakes will be ‘geek’ or ‘mac’ inspired with contributions from a range of bakers including Angry Bird cupcakes, cookies featuring portraits of Steve Jobs, Twitter inspired treats, cookie replicas of iPhones and their applications, ‘Mac’ shaped apple pies & even an 100% edible life sized creation of a Mac lap top."